Hyderabad, Jan 10, (way2newstv.in):Komati Reddy Brothers hopes over the PCC president's office for two years. If they were in office, they made public declaration that the party would be brought to power. Rahul Gandhi's decision to continue as the PCC president, Komatireddy broke with an unexpected shock to the brothers. If he is a PCC president, will anyone vote for the party to come to power? 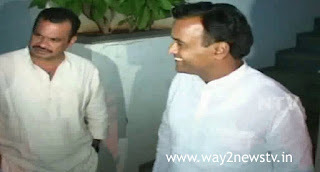 Komati Reddy Brothers has been criticized for the best time. The TPCC liabilities were handed over to the public and made public announcements to win the party in 100 seats. Sonia Gandhi and Rahul Gandhi were in the chair and spoke to them. This led to the disaster in Komati Reddy Brothers. Brothers had a new problem when the election was headed by Uttam Kumar Reddy. After the defeat of the Congress in the 2014 elections, the PCC presidential mandate was ordered. Komatireddy Brothers, who were political opponents for whitework, worked against him as a party president in the face of his intimidation and political equations. Uttamkumar Reddy was the best actor for any event. Komati Reddy brothers stayed away. This was criticized by the party for failing to win the elections in GHMC, Warangal, Narayankhed and Medak. Koppal Raju, Madhuashki, Survey Satyanarayana and Hanumanamaravaras participated in the recently concluded palvayi memorial meeting in Palvayi. After that, Komatireddy Rajagoparreddi was in the house and announced that he would contest from the next election. Brothers immediately complained that the Congress did not support the whole of the press. The next step in the Brothers was the most interesting as the PCC chose to make this background in the background.